April after disclosing her true girth, in 3004 (4ACV16). April is an enormous woman who spent her $300 tax rebate on a radical treatment that disguised her as a much thinner person. After disguising herself to be thin, she met Professor Farnsworth, who too was disguised, but as a young person thanks to the full pound of stem cells from GeneWorks, S.K.G.. The two met and spent the evening together, until the Professor tried to run as his stem cells wore off. She caught him, his true identity revealed, and so she revealed her true weight. They agreed it was better to know the truth, and proceeded to passionately make out. In 3011, she travels on the Planet Express airline, and crash lands along with the rest of the passengers on the rock planet homeworld. Her gender was changed to nothing, then to male, and finally back to female. She also served on the jury of the case of Mom v. Farnsworth. 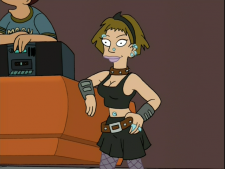 Her name was not known until it was revealed on the commentary for the episode "Neutopia". April: It's better for us to just be ourselves. You, as wrinkled as a prune. This page was last edited on 14 December 2015, at 21:07.